What is the Mentoring Game™? 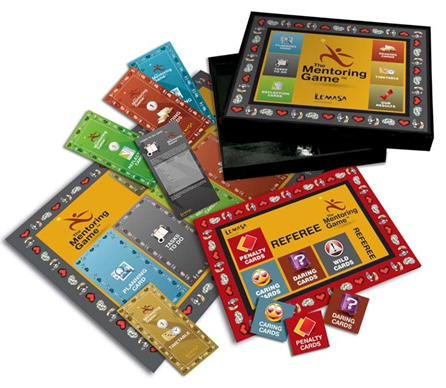 The Mentoring Game™ is a board game played by Mentor-Mentee teams. The purpose of the game is to facilitate bonding between Mentors and Mentees. There are many reasons why mentoring programmes fail. One reason could be failure to properly establish the relationship between the two parties. The mere assumption that two people could become mentor and mentee does not ensure that they will succeed in working towards achieving a common mentoring goal. Furthermore, work pressure could lead to mentoring priorities being neglected. The purpose of the Mentoring Game™ is to help to firmly establish the mentor-mentee relationship in order to enable it to withstand the pressures of normal business. What is the theoretical basis of the Mentoring Game™? The Mentoring Game™ is based on Discovery Learning. Discovery Learning is an inquiry-based, constructivist learning theory about what takes place in problem-solving situations. The learner draws on personal experience and existing knowledge to discover facts, relationships and new truths to be learned. During Discovery Learning learners explore and manipulate objects, wrestle with questions and controversies, and conduct experiments. Learners are more likely to remember concepts and knowledge that they have discovered on their own. • providing a tailored learning experience. What does the Mentoring Game™ entail? The Mentoring Game™ involves the Mentor - Mentee teams that compete against each other during a workshop day. The game entails nine tasks that each team has to complete within a given time. If they deliver late, a Penalty Card is issued. Penalty Cards are also issued when teams disobey game rules. During the day, each team can choose either Caring Cards or Daring Cards. Teams can earn additional points by successfully completing the tasks on the Caring and Daring Cards. Wild Cards are issued at random during the day, and the teams then have to deal with unexpected tasks. Mini-lectures assist the teams with completing the tasks. The topics covered by the mini-lectures are People Skills; Trust; and Conflict and Confrontation. There are also Reading Cards containing theoretical information on topics such as People Skills; Mentor – Mentee Roles; and What could go wrong in the Mentorship Programme? The team that has the highest score at the end of the day receives the winners' trophy. What does each Mentor – Mentee team take away from playing the Mentoring Game™? Reading Cards, as well as the completed Task Cards and their Mentoring Plan (project plan). How many people play the Mentoring Game™? The Mentoring Game™ can be played by a minimum of three and a maximum of six Mentor – Mentee teams. A Referee oversees the game. What is included when you purchase the Mentoring Game™?